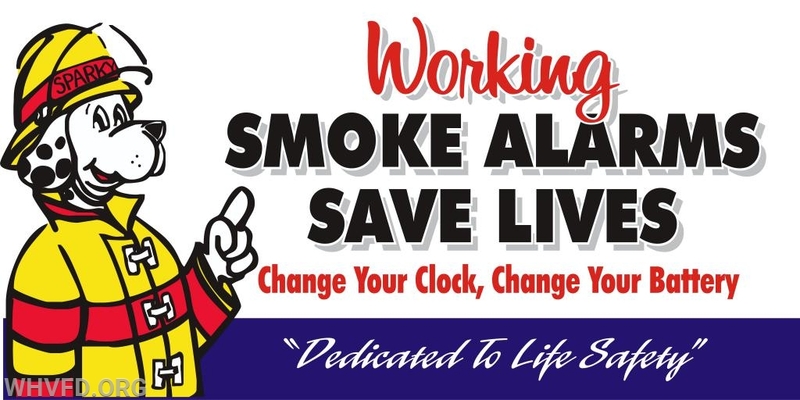 The West Harrison Fire Department would like to remind everyone to change their batteries in their smoke detectors as you change your clocks for day light savings time. According to the National Fire Protection Association, families have an average of three minutes to get out of their homes after their smoke alarm sounds due to fire. However, those life-saving minutes only occur when alarms are fully powered and operational. The NFPA reports three out of every five home fire deaths across the nation resulted from fires in homes with no smoke alarms or no working smoke alarms. In fires in which the smoke alarms were present but did not operate, more than half of them had missing or disconnected batteries after nuisance alarms, such as the alarm going off during cooking. Dead batteries caused one-quarter of the smoke alarm failures. Hardwired power source problems caused 7 percent of the failures. The rest of the failures occurred because of defective or improperly installed alarms. -Place a smoke alarm on every level of your home outside sleeping areas. If you keep bedroom doors shut, place a smoke alarm in each bedroom. -Prepare and practice an escape plan – know at least two ways out of a room, crawl low under smoke and plan where to meet outside.